The New Four Food Groups! So I came across this recipe the other day for White Pizza Dip. It looked so yummy that I had to make my own version. I was a little skeptical since it has cream cheese in it and I've made some dips before where the cream cheese just made the dip runny. This dip has roasted grape tomatoes and roasted garlic which are scrumptious, four cheeses, fresh basil, and herbs that sing in your mouth! It's awesome! But, if my husband and I ever did make pigs of ourselves, it was while eating this dip. You will be AMAZED at how much it tastes like pizza! We ate so much of it before dinner was ready that we didn't even eat our dinner. It's embarrassing, I know. We even stood in the kitchen and ate it without telling the kids that it was there. And then we hid the leftovers. We'll go put ourselves in time-out now. NOTE: The cream cheese has to be really really soft so it will blend with the other ingredients. If it's not, you will get pockets of just cream cheese. Also, after we devoured the dip, we thought maybe we should have added some pepperoni slices or cooked Italian sausage to the dip. Preheat the oven to 400 degrees. Cut the tomatoes in half and put them on a sheet pan. Put the garlic on the pan too. Lightly drizzle olive oil around and sprinkle the tomatoes and garlic with salt and pepper. Toss to coat. Roast the tomatoes and garlic in the oven for about 20-25 minutes or until the tomatoes start to caramelize. Remove them from the oven and chop all of it. Reduce the oven temperature to 350 degrees. 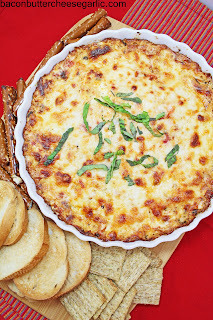 Take a couple of tablespoons of the Mozzarella and Monterrey Jack cheese and set it aside for the top of the dip. Stir together the cream cheese, the Parmesan, Mozzarella, Monterrey Jack, chopped tomatoes and garlic, basil, oregano, and thyme. Put the mixture into a dish (I used a tart pan) and spread it to the sides. Sprinkle on the reserved Mozzarella and Monterrey Jack cheese. Bake the dip for about 20-25 minutes or until it's heated through and the cheese on top is browned. Serve with crackers, toasted French bread slices, or pretzel sticks. I am a true Texas girl. I love Texas, I have lived here all my life, and I won't ever leave. I'm very proud of my state. I love the people, the food, the diversity of the land and the people. I have traveled some and been to three islands and Mexico. I love our neighboring states. I love the heritage here. I also love the food! One such food that Southern folk love is Chicken Fried Steak. Supposedly Lamesa, Texas is the birthplace of this delicacy and they hold a "Chicken Fried Steak Festival" every year. There is a lot of German heritage in Texas, and this dish came about as a version of Wiener Schnitzel, which is a German fried piece of veal or beef, just like the steak. 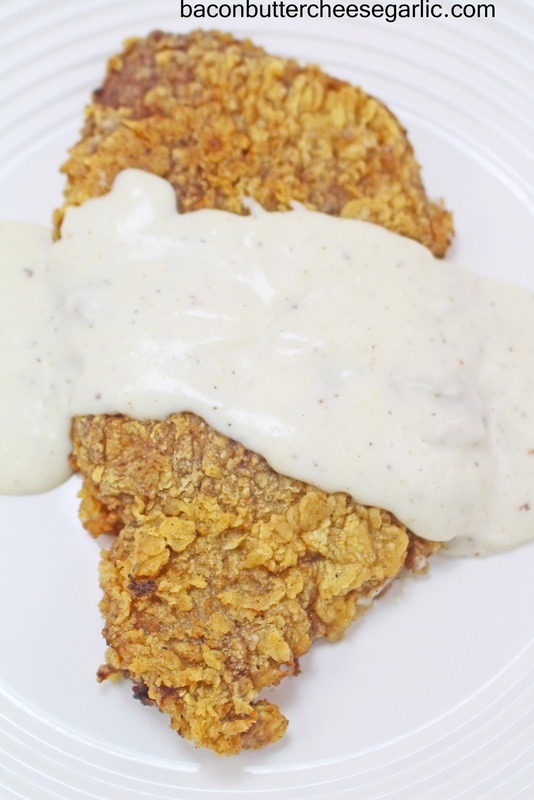 Here in Texas, Chicken Fried Steak isn't complete without cream gravy. And most of the time mashed potatoes and fried okra go along with it. I just adore fried okra! Anywho, the trick to getting a very tender Chicken Fried Steak is to use cube steak, which is round steak that the butcher has tenderized in a machine that punches a lot of holes in it and then tenderizes it again. Then the steak gets double dredged and fried in peanut oil. The result? A darn tasty dinner. Enjoy! NOTE: I bought two cube steaks and just fried them as is and then we cut them both in half for our family of four. Also, you can use this same method and recipe for chicken fried chicken. You will just need to put the chicken into the oven at 200 degrees and let the chicken finish cooking to 165 degrees internally. Mix together the flour, seasoned salt, black pepper, garlic powder, and onion powder. Set it aside. Mix the eggs with a splash of water and set it aside. Preheat about an inch of peanut oil in a large skillet on medium high heat. Dip the steaks into the flour mixture, into the egg mixture, and then back into the flour mixture, pressing to coat. Fry the steaks until they are golden brown on both sides, about 5 minutes per side. You can keep them warm in a 200 degree oven if you need to. In a separate skillet, melt the bacon grease (or shortening or lard). Whisk in the flour until it is smooth. Add the milk in and cook and whisk until the gravy is thickened and bubbly. Season the gravy with salt and pepper. Serve the gravy over the steaks. If you use Pinterest a lot like I do, you've probably seen a picture with a recipe for "Cajun" Chicken with Pepper Jack and Spinach. I'm not sure of the original source since it links back to so many different places. But I thought I'd give it a try. And why it's called "Cajun" is strange to me because the only thing I find Cajun about this is the spice used on the outside of the chicken. I actually made this chicken twice. The first time I followed the recipe almost exactly. The one thing I left out was that there were bread crumbs on the outside of the chicken. I was already concerned that the recipe would turn out dry because of the filling, so I left the bread crumbs out. I also added bacon on the first try since it is one of the New Four Food Groups. As I suspected, the filling was overbearing and way too dry. So on my second attempt, I again left out the bread crumbs. I skipped the bacon since I was out at the time (gasp!). But this time I added cream cheese to the filling. It turned out great this time. The filling wasn't dry and the chicken was perfect. Enjoy! NOTE: You will need an ovenproof thermometer to make sure the chicken is cooked to 165 degrees. My chicken was done in about 40 minutes, but my oven is most likely not like yours. Preheat the oven to 375 degrees. Cut pockets into each chicken breast but don't cut all the way through. Generously season the inside and the outside of the chicken with the Cajun seasoning. 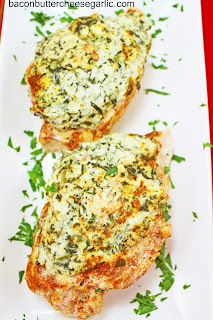 Stir together the cream cheese, Pepper Jack cheese, spinach, garlic powder and onion powder. Stuff the filling into each chicken breast. Secure the outside edges with toothpicks. Here's a picture I took of the first attempt at the chicken before I cooked it just so you get an idea of where the toothpicks go. Put the chicken on a sheet pan and sprinkle on a little more Cajun seasoning, if desired. Bake the chicken for 40-45 minutes or until a thermometer registers at 165 in the chicken. My husband says everything is good on a stick, so I pulled a fast one and put a Salad on a Stick! I love the presentation. 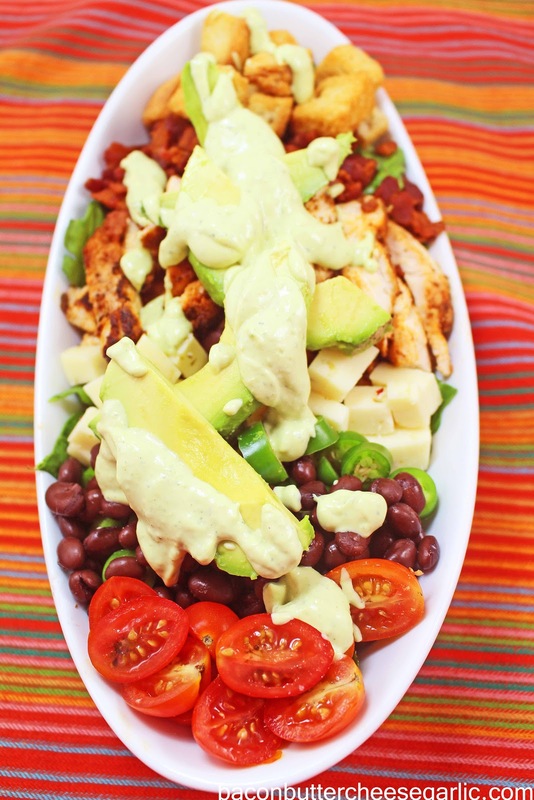 You can put whatever on it you'd like and use any dressing, although my Avocado & Jalapeno Ranch Dressing is pretty tasty. You could even add diced turkey or grilled chicken and easily make this a complete dinner. Enjoy! For the dressing, put all of the dressing ingredients into a blender and blend until smooth. Refrigerate the dressing until you're ready to use it. Cut the lettuce into four wedges. Then cut each wedge into three or four smaller wedges, being very careful to keep the sections intact. Carefully cut each boiled egg in half and then cut each half in half so you have four wedges from each egg. Be careful not to knock the yolks out. Cut the cheese into about 1 inch chunks. Slice the green onions into 1 inch slices. 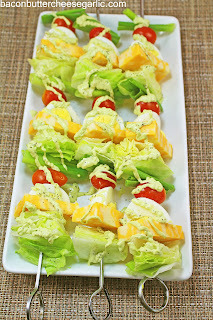 Skewer a lettuce section, a chunk of cheese, one of the egg wedges, a tomato, and a green onion slice. Repeat until all the skewers are full. Drizzle the dressing over the sticks and sprinkle on a little black pepper, if desired. A favorite quick meal at our house are these Tostadas. They are easy to put together and quick and everyone loves them. I always have leftover pinto beans or refried beans in the freezer, and this is a great way to use them up. The toppings can be whatever you like. My husband only wants beans, cheese, and hot sauce on his. Our son likes beans, cheese, and taco meat. My daughter and I like them with all of that plus lettuce and sour cream. But you could even use chicken fajita meat or shredded chicken or pork. Just think of all the ways you could use leftovers here! Even mashed black beans would be good. Enjoy! NOTE: All of the toppings are optional. My list is just suggestions, however I think the beans are a must. You can use canned refried beans, or here are two of my recipes for refried beans: Regular Refried Beans (click for recipe) or Frijoles Borrachos, also known as Drunken Beans, which are cooked with beer and lots of other good stuff. Both of my recipes are crockpot recipes, and both make quite a bit of beans. As I said above, they freeze really well in small containers and can be heated up easily in the microwave. Preheat the oven to 350 degrees. 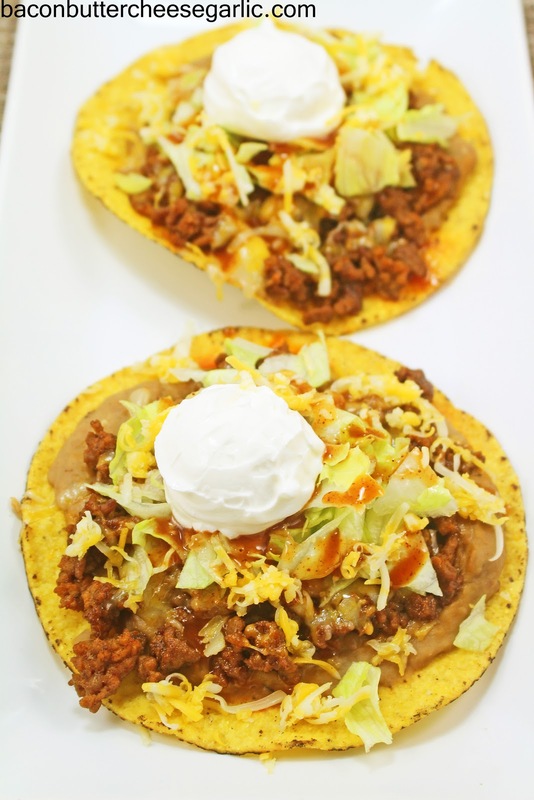 Place the tostada shells on a sheet pan. Heat them in the oven for 5 minutes. Remove them from the oven and spread on beans, meat, and cheese. Return them to the oven for a few minutes to heat the toppings and melt the cheese. Serve with the lettuce, hot sauce, sour cream, or whatever toppings you like. When I told my husband we were having salad for dinner, he said, "Salad? Can we make something to go with it?" Little did he know, I was making a man salad. A salad fit for a man, not some frou-frou barely there micro greens with a little drop of dressing. I saw a picture of a salad somewhere that had fried chicken strips, spiced pecans, some other veggies, and deviled egg halves. 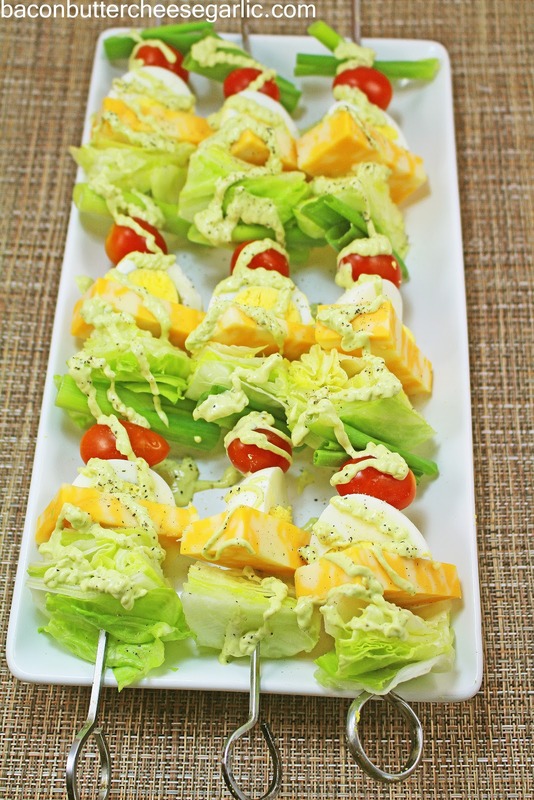 Now, I had intended for this salad to have deviled eggs on it. We made the deviled eggs, but we thought we'd pop them in the freezer to get them cold faster since we were short on time. Public service announcement...deviled eggs freeze really really fast and then they turn crunchy. So, alas, no deviled eggs. I also had intended on doing the fried chicken strips here, but my husband had a better idea. Blackened chicken. And you know what, he was right. It was also his idea to add in the sliced raw serrano peppers, and I so generously let him eat all of them. This salad was so filling and hearty and delicious! The stars here are the blackened chicken and my Avocado & Jalapeno Ranch Dressing. The rest of the salad is customizable. Add what you want, take out what you don't want. And, while you can't see it in the picture, there really is lettuce underneath all of that manly goodness. Enjoy! For the dressing, put all of the ingredients into a blender and blend until smooth. Keep the dressing in the refrigerator until you're ready to use it. Preheat the oven to 350 degrees. For the chicken, mix all of the spices and seasonings together in a bowl big enough to fit the chicken in. Dip the chicken on both sides into the blackening spice, pressing down to coat. Melt the butter in a large skillet on medium high heat. Brown the chicken on both sides in the butter. 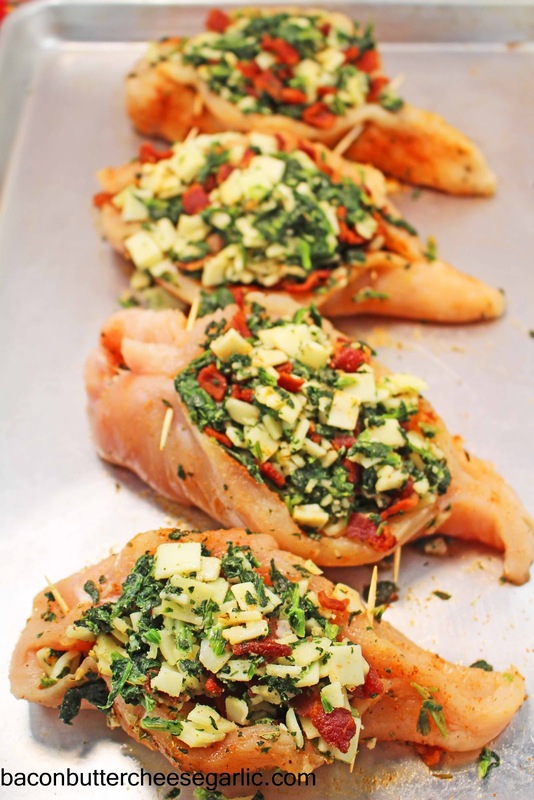 Put the chicken onto a sheet pan and place it in the oven. Cook the chicken for 15-20 minutes or until it reaches 165 degrees internally. Let the chicken rest before slicing it. To assemble the salad, place the chopped lettuce into a bowl and line the sliced chicken and the remaining toppings in a row like a cobb salad. Serve with the dressing. We recently bought some new spices from a local small business in Hobbs, New Mexico. 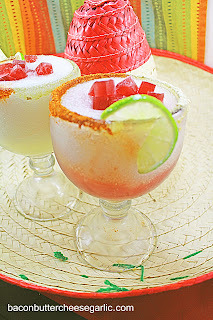 We enjoy their products, and thought we'd do some Margarita Sangria Swirls with two of their products, Sizzlin Salt and Chile Lime Salt. The company is Big T Spice Company if you want to check them out. We aren't being reimbursed for this post. I just wanted to share that with you. We found some miniature ice cube trays that had small squares at Bed, Bath & Beyond, and we used them to freeze some sangria for our swirls. We made the swirls two ways: One with just the sangria cubes on top and one with the cubes and a swirl of sangria. The margarita portion of this drink is so easy and tastes so much better than any mix I've tasted. We bought a bottle of Cruz Garcia Real Sangria for about 10 bucks, which isn't bad, but your favorite will do. This recipe made a full blender of margaritas. They looked great and tasted fabulous! Enjoy! If you are going to use the sangria cubes, pour some sangria into an ice cube tray (the smaller the better) and freeze. It won't freeze completely solid and will be slightly slushy. Put your schooners or margarita glasses into the freezer to chill. Put the limeade, tequila, and Triple Sec into a blender. Fill the blender the rest of the way up with crushed ice. Blend until smooth. Keep in the freezer until you're ready to use it. Put some of the red seasoned salt and some of the chile lime salt (or regular salt) onto a paper plate. Rim the edges of the glasses with a wedge of lime. Dip half of the glass into the red salt and the other half into the chile lime salt. Pour some of the blended margarita into each glass carefully. You can swirl in some sangria and top with the sangria cubes or just use the cubes. Garnish the glasses with a slice of lime. I've never eaten or cooked a pork tenderloin that turned out anything but dry. It seems so appealing in the grocery store. They even have some that are preseasoned or marinated that may seem tempting. It's large enough to feed a family of 4. It's quick cooking. But...it's always dry. If you have a recipe that turns out moist, well, then you're doing a lot better than me. Now, I've seen pork loin, which is an entirely different cut of meat, but I've never tackled it before. I've heard that they are juicier and more flavorful. It's like the tenderloin is the white meat and the loin is more like dark meat, even though it's not dark. 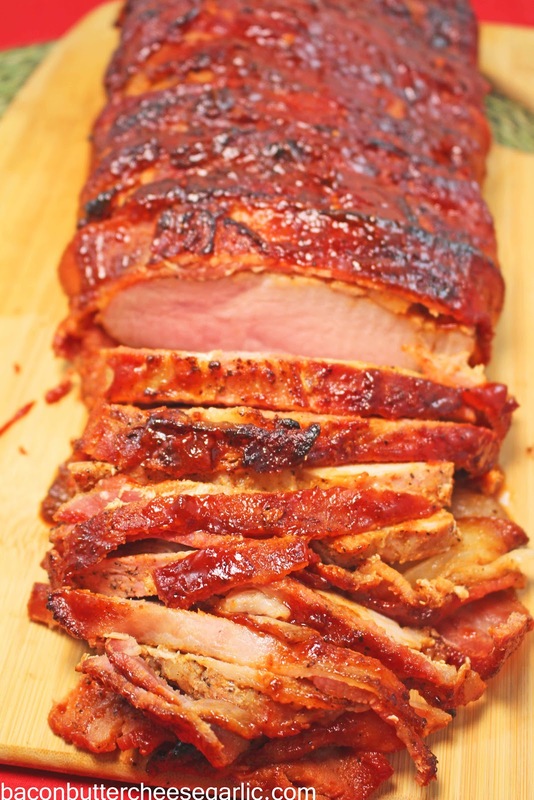 I stumbled across a recipe for a pork loin recipe that intrigued me. Put a good rub on it, wrap it in bacon, and grill it, basting with BBQ sauce. We did a fancy weave of bacon. We made our own rub. We made our own sauce. We grilled it. Let me tell you, it was so darn good that I stood in the kitchen practically licking the BBQ sauce and bacon drippings off of the pan my husband brought it in on. I actually really made a spectacle of myself. It was like a kid licking the cake batter off of their momma's spoon. The bacon almost tasted like bacon candy. This stuff was awesome! 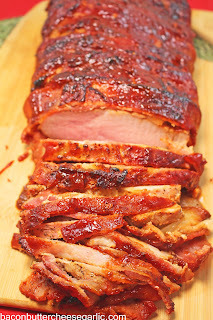 And, whether you make a fancy bacon weave like we did or wrap the bacon willy nilly around the loin, who cares! 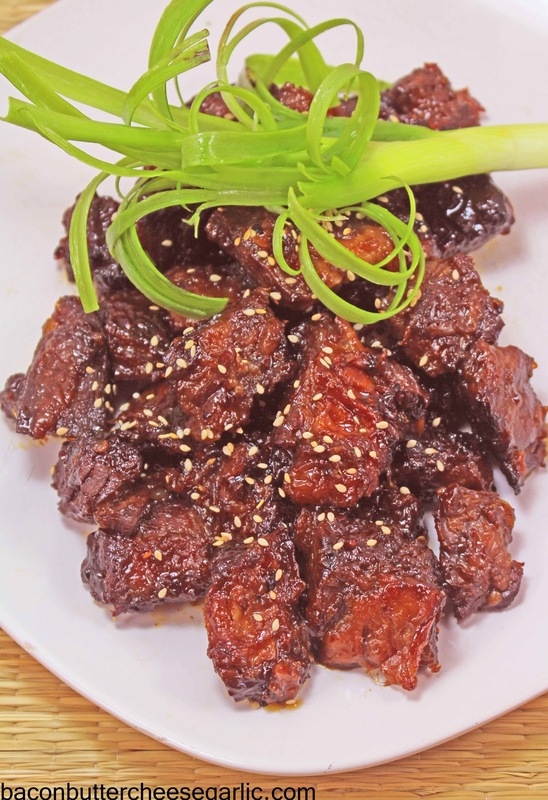 It tastes so good and is so juicy and flavorful that it doesn't matter what it looks like! Enjoy. NOTE: You will need to use thin sliced bacon for this. If you must use thick sliced bacon, you will need to put the wrapped loin under the broiler (both sides) to partially cook the bacon. Otherwise the bacon will never get done. Whether you do a weave or simply wrap the loin with the bacon, you will need to secure the ends with toothpicks, which can be challenging for cooking. You can broil the toothpicked side so that you don't need to sear that side and then sear the other side on the grill. You will need a grill safe thermometer for making sure the pork is done inside. You will also have rub leftover, so you can save it for another use or halve the recipe. For the BBQ sauce, put all of the ingredients in a pot. Simmer for about 15-20 minutes over medium heat, whisking occasionally, until it is thick and bubbly. Refrigerate until you're ready to use it. Mix the rub ingredients together and set them aside. Reserve about 1 C of the BBQ sauce for serving. Two hours before cooking the loin, let it come to room temperature. Preheat the grill to 500 degrees. Trim any excess fat off of the pork loin. Rub the loin with vegetable oil and then sprinkle some rub onto the loin on all sides. You can do a bacon weave or just simply wrap the slices of bacon around the pork loin and secure the ends with toothpicks. Sprinkle some additional rub all over the bacon. Sear the pork loin (not the toothpick side) on the grill over direct heat for around 7 minutes to cook the bacon. Put the loin on top of a rib rack or a roast rack and put the rack on a sheet pan or foil. Turn the grill down to low to medium heat. Grill the meat, basting occasionally with BBQ sauce, until the internal temperature is 150 degrees (ours took somewhere between 30-45 minutes). Take the meat off of the grill and cover it with foil. Let it rest until it reaches 160 degrees. Slice the loin and serve with the reserved BBQ sauce. 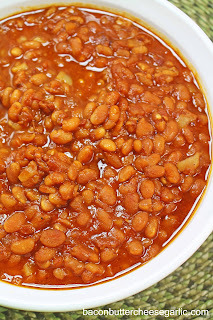 If you love homemade baked beans but don't want to use anything canned, you're going to love these homemade Crockpot Baked Beans! They're easy and taste great! NOTES: You may add more or less ketchup, mustard, brown sugar, and Worcestershire sauce. I just found that, when the beans were nearly done, I needed to add more sweetness and tang. These measurements were to my liking, but feel free to adjust it to yours. Also, I started out with 2 1/2 C water, and I felt that there was too much liquid in them. Start with 2 C and add more during the day, if necessary. I also prepped all of the other ingredients the night before and put it all in a container in the fridge so that I could easily add everything quickly the next morning before work. I let my beans cook longer than the time suggested, and they were great! Soak the beans in water overnight. The next morning, drain the beans. Put the beans and the remaining ingredients into the crockpot. Cook the beans on low heat for 8-10 hours or until the beans are done and the sauce is thick. 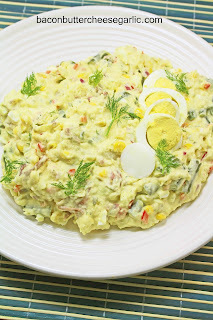 Very rarely do I vary from my traditional Southern Potato Salad, but I wanted to incorporate different veggies and a different dressing for this New Potato Salad. And it was really good! Enjoy! Boil the potatoes until tender and drain. Cool slightly. Boil the green beans until desired consistency (my husband likes them a little cruncy). Drain the green beans and cool slightly. Whisk together the mayo, apple cider vinegar, dill, brown mustard, and salt and pepper. 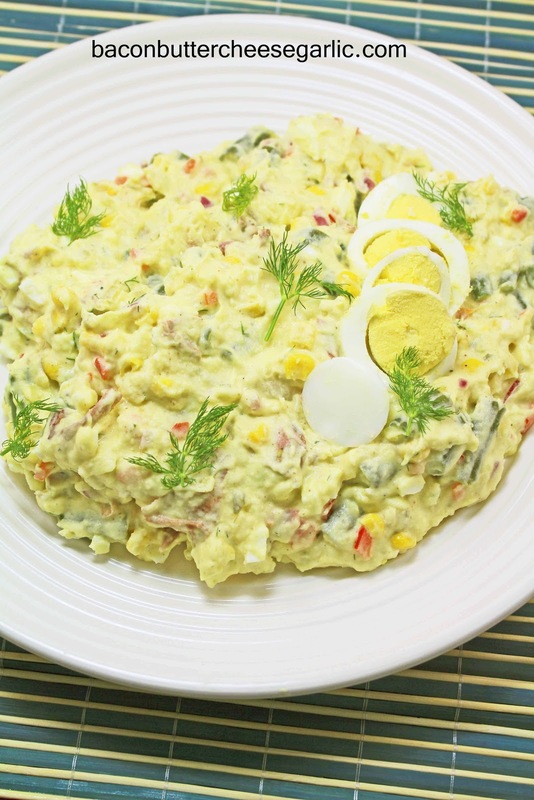 Stir the potatoes, frozen corn, green beans, eggs, onion, bell pepper, potatoes and chopped pickles into the dressing. You can serve the salad either warm or cold. I recently became promoted to manager of the restaurant I work in, which I'm super excited about! I love my job, the work I do, and the people I work with. I actually really enjoy going to work every day. However, it also means that I have to stay at work longer. Which means I need to try to find some quicker meals to make at home. I recently saw a version of this recipe in a magazine, and it sounded quick and easy to put together. And the fact that my husband gets to grill it makes the house stay cool. 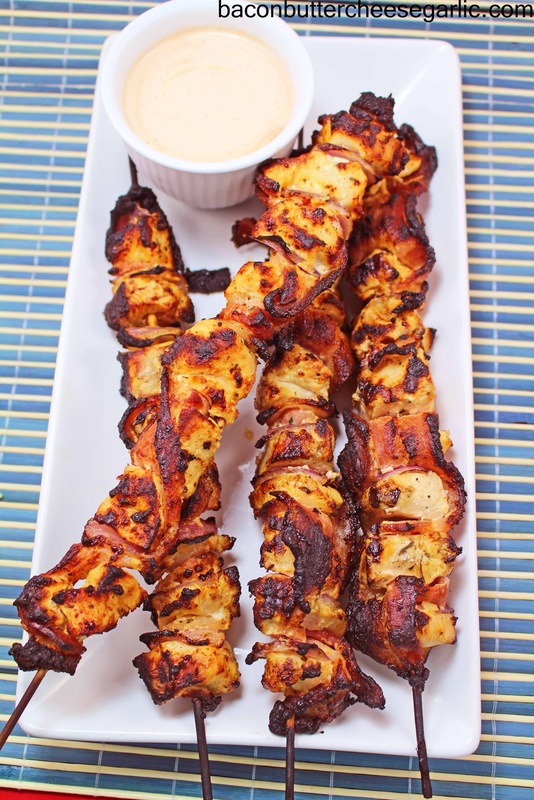 These Chicken Bacon Ranch Skewers (yes, everything is better on a stick) are marinated in a Ranch and hot sauce mixture, then skewered with bacon and red onions, and grilled to perfection. And they're darn tasty! NOTE: The bacon between the chicken may not cook fully if you use thick bacon. I would suggest partially cooking thick bacon before skewering it or use thin sliced bacon. Cut the chicken into about 1/2 inch pieces. Whisk together the Ranch dip mix, buttermilk, hot sauce to taste, and mayo. Put the chicken in a large zipper bag. Reserve about 1/2 C of the dressing for serving and pour in the remaining dressing in the bag and squeeze the chicken around in it to coat. Seal the bag and refrigerate the chicken for at least an hour. Soak the bamboo skewers for about 30 minutes in water. Put one slice of onion on a skewer. Take a piece of bacon and thread one end after the onion. Add a piece of chicken. Weave the bacon onto the skewer (see picture above) and repeat with chicken and onion. 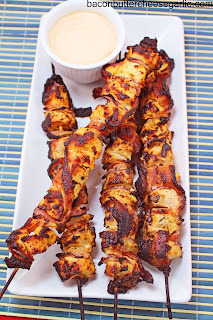 Your skewer should have the bacon strips weaved in and out around the onion and chicken. Grill the skewers over indirect heat for 12 to 16 minutes or until they register at 165 degrees internally and the bacon is crisped. Serve with the reserved Ranch dressing mixture, if desired. It is hot here in West Texas. I mean HOT! It's been close to 100 degrees all week and very humid, which it's not usually humid here. But we've had a lot of rain lately, so the humidity level is up. It's definitely time to break out the crockpots and leave the oven off. Awhile back, I posted a recipe for Mississippi Roast. I was amazed at how so few ingredients could turn into such an outstanding dinner. It got my wheels turning, and I decided I needed to figure out something like this for chicken. I settled on Crockpot Buffalo Chicken. While there are a couple more ingredients than the roast, It's still pretty simple. I prepped the veggies the night before and had everything ready for the next morning. When I got home, the house smelled fabulous! I was concerned that the meat would be greasy, but, once I shredded it, it was perfect. It made for some tasty sandwiches for dinner. Grab a bag of chips and get ready! I used a combination of boneless, skinless chicken thighs and boneless skinless chicken breasts. It turned out to be a big hit at my house! Enjoy! NOTES: I only used one packet of Ranch dip mix in mine, and I felt that it needed more. But that all depends on how salty or strongly flavored chicken you want. I used a whole cup of buffalo sauce, and it wasn't spicy. Again, personal preference. Also, I started my chicken early in the morning and let it go until dinner time. I found that the cook time in the crockpot should have been cut way down since the meat was a little too soft. I wouldn't leave it in the crockpot any longer than 5 hours, but start checking it at 3 1/2 hours for tenderness. Once the chicken starts to pull apart easily, shred it right then. Put the celery, onion, carrot, and garlic in the bottom of the crockpot. Add the chicken over the top. Sprinkle the packet(s) of Ranch over the top of the chicken. Pour in the buffalo sauce and add the stick of butter on top. Cook on low for 3-5 hours or until you can shred the chicken with a fork. Shred the chicken in with the sauce. The chicken absorbs the sauce. 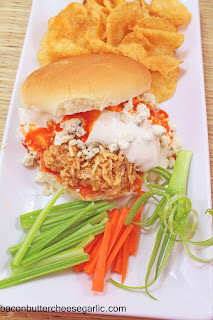 Serve the chicken on buns with Ranch dressing, blue cheese, and more buffalo wing sauce and with the celery sticks, carrot sticks, and green onions on the side, if desired. 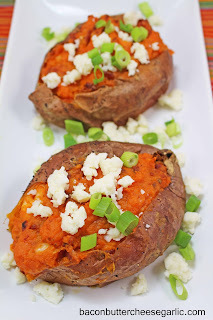 These delicious Twice Baked Sweet Potatoes are filled with chipotle peppers, Cotija cheese, and bacon. And they're darn tasty! Preheat the oven to 400 degrees. Wash and dry the potatoes. Rub each potato with some olive oil and season them with salt and pepper. Wrap the potatoes in foil and place them on a sheet pan. Bake the potatoes for 45 minutes to 1 hour or until the potatoes feel soft to the touch. Remove them from the oven and reduce the oven temperature to 350 degrees. Using oven mitts or a potholder to hold the potatoes, remove them from the foil. Split them down the middle and scoop out most of the inside into a bowl. Mash the insides with the butter until the butter is melted. Add in the remaining ingredients and stir it together. Fill the potatoes back up with the filling. Bake the potatoes for an additional 20 minutes to cook the filling and melt the cheese. So last night we almost burned the house down by accident. It's kind of funny, but kind of not funny since my parents' house, along with 508 other houses, burned to the ground in Colorado in 2013. But I'm going to not dwell on the past, and I'm going to tell you the story anyway. So we bought two whole chickens, and we wanted to grill them butterflied under our salt block and baste them with homemade teriyaki sauce. We made the sauce, butterflied the chickens, got the grill ready, and heated up the salt block. My husband started grilling the chickens and basting them. Meanwhile, I was in the kitchen making this Bacon & Eggs Ramen and cooking some potstickers. He turned the chicken a few times, basted them, watched them. He came in for a second and was standing in the kitchen. Next thing I know, he yelled a word I can't repeat here and ran out the back door. I looked out the window, and our entire back porch was engulfed in smoke. I ran out there and flames were shooting high. He turned the grill off and fanned the flames off of the chickens. He singed off all of the hair on one of his arms. When the smoke cleared, he told me that the flames were shooting out of the back side of the grill and they were high! Luckily we didn't set our roof on fire since the grill was a little close to the house. We brought the chickens in and tried to salvage them, but it was too late. By then, I remembered my potstickers that were steaming away on the stovetop in a skillet. Nope, too late for those as well. Most of them were burned on the bottom. I made this awesome ramen with crispy garlic (which is fabulous if you like garlic), bacon, ramen eggs, and spinach. While we found that the ramen was a little too salty, it was really really good. My goal was to give you a picture of some beautifully grilled chickens, but I didn't think black, flaming chickens would go over very well. It's a little funny that, although we have a lot of experience at this, we can still screw up dinner. Enjoy the ramen. NOTES: We tried cooking the ramen with chicken stock, but I changed the recipe to water. The combination of bacon, soy sauce, and chicken stock left the ramen a bit too salty. I adjusted the recipe and just used water to cook the ramen. Add in a 1/8 C of soy sauce and taste it to see if you need more. Also, ramen eggs are a popular accompaniment to ramen in Japan. They are soft boiled eggs that are peeled and marinated in a soy sauce mixture. They are so tasty. You're going to love them. Bring a pot of water to boil. Pierce one end of each egg with a needle and carefully lower the eggs into the water with a large spoon. Reduce the heat very very slightly and cook the eggs for exactly six minutes. Remove them from the heat and place them under cold running water. Whisk together the remaining ramen egg ingredients together. When the eggs are cool, very carefully peel them and put them into the marinade mixture. Marinade the eggs for at least 3 hours and up to overnight. Cut the bacon into small pieces and place it in a large skillet. Cook the bacon until crisp and drain on a paper towel. Pour off all but 2 T of the bacon grease. Very thinly slice the garlic cloves. Turn the heat down to medium and gently fry the garlic cloves in the remaining bacon grease until lightly browned. Don't walk away from the garlic because it can burn quickly. Remove the garlic and drain it on the same plate with the bacon. Add the water to the same skillet and bring to a gentle boil and use a whisk to scrape up all the yummy bits on the skillet. Add in the soy sauce, chili paste, ginger, and rice wine vinegar. Add in the ramen and cook for about 5 minutes or until the ramen is done. Remove the pan from the heat. Stir in about 10 spinach leaves. 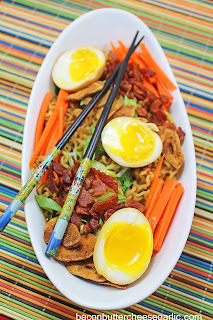 Spoon the ramen into bowls and serve with halved ramen eggs, carrot sticks, the bacon, green onions, and crispy garlic. Y'all know I love Pinterest, and I get a lot of ideas there. 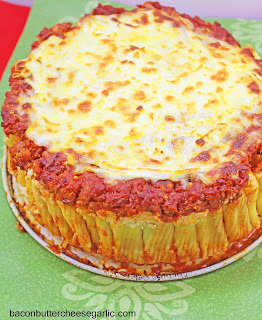 I've seen this Rigatoni Pie a lot, and I was very skeptical on whether it would truly work or not. As you can see in the picture, it did! I used my own recipe here and just used the idea and techniques found on Pinterest. However, there are a few hiccups to getting this thing to work. Pretty cool, huh! But hiccup number one is the cheese. I guess I didn't pay attention to the instructions. I used shredded Parmesan cheese, the kind from a bag. But the cheese melted and kind of clumped up in places and a lot stayed in the pan. It's okay though. It made a good snack. The canned grated Parmesan cheese would have worked a lot better here. 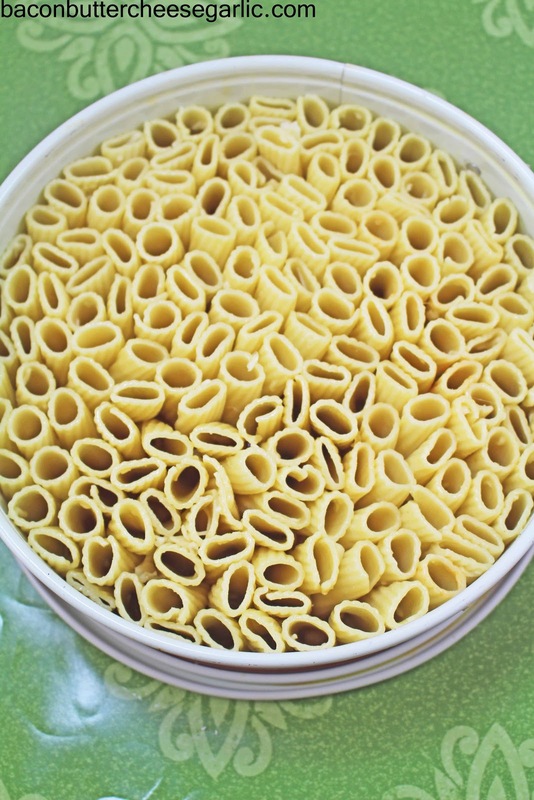 Secondly, I didn't think about cooling the pasta before lining them up, so it was a little too hot to handle. It's also very time consuming, but my husband helped. Four hands are better than two here. The next step is getting the ricotta into each piece of pasta. What better way than with a pastry bag...unless of course you cut the hole too big. Also, I didn't have enough ricotta filling to fill all of them, but I've adjusted that for you in my recipe below. Still not a disaster. Next you sauce the top and bake it, add cheese, and bake a little more. Then you let it cool 15 minutes before running a knife around the outside and opening up the outer ring. Which brings me to our last hiccup. We decided to put a little sauce and cheese on the bottom of the pan before lining up the pasta. When we opened up the ring, some of the outer pieces fell off. So we put the ring back on and let it cool a little longer. We managed to get the pie to stay together for the picture, but moving it back to the kitchen counter caused a few more to fall off. I'm not sure if it's because of the sauce on the bottom or because I didn't slightly undercook the pasta when boiling. But, all in all, it tasted fabulous and we all really enjoyed it. And it was kind of fun! Enjoy! Drizzle some olive oil into a skillet and cook the onion until tender. Add in the Italian sausage, garlic, chili flakes, and salt & pepper to taste. Cook and break up the sausage until it's well browned. Stir in 2 C of the marinara sauce. Reserve the remaining sauce. Mix the ricotta filling together and set aside. Boil the rigatoni until it's soft but not all the way done. Drain and let it cool slightly. Stir a bit of olive oil and the grated Parmesan into the pasta. Preheat the oven to 400 degrees. Spray the bottom and sides of a springform pan with nonstick spray. This next step is optional. As I said above, I'm not sure if the sauce in the bottom is what made some of the pasta fall off. But you can spread 1 C marinara sauce in the bottom of the pan and sprinkle on a little Mozzarella. Next line all of the noodles upright in the springform pan (see picture above). We had a few noodles leftover. Take a pastry bag or a large zipper bag and put the ricotta filling into the bag. Snip off one end and squeeze the ricotta filling carefully down into the pasta. Next spread the meat sauce over the top of the pasta. Bake the pie for 15 minutes. Sprinkle on the remaining Mozzarella and bake another 15 minutes. Let the pie cool for at least 15 minutes. Run a knife around the inside edge of the pan and then release the ring. Carefully remove the ring off of the pie. Serve it with the remaining marinara sauce, if desired. When I was a kid, I was a curly towhead, which means my hair was so blonde it was nearly white. My mom would sometimes fix my hair in a bun. When it came time to take the bun out at night, she would brush out my hair and I looked liked Gilda Radner playing Rosanne Rosannadanna from Saturday Night Live. Yes, I know I'm telling my age. I loved it when my hair was like that. I used to love Saturday Night Live when I was a kid. It was a lot cleaner back then. The original cast was nicknamed "The Not Ready for Prime-Time Players," and included greats like John Belushi, Jane Curtain, Laraine Newman, Chevy Chase, Gilda Radner and Dan Aykroyd. They were hysterical! Steve Martin also had a show that came on before it where he did his recurring theme of wearing an arrow on his head and saying, "I'm a wild and crazy guy." Good times. TV sure has changed a lot in my time. In fact, while there are more technological changes by the minute, it's not as fascinating as some of the changes I went through. I remember the first day of MTV, back when they actually played videos. I remember the first home computer. I remember the first microwave. It seemed to take up half of the kitchen counter and took like eight minutes to heat up something small. But it beat heating up SpaghettiOs or a can of green beans on the stove. I remember the first walkman, the first VCR, the first CD player, the first cell phone. I remember when our TV only had about six channels. Crazy, I know. Yes, it used to be that way. Anywho, none of that really has anything to do with my recipe today. I just had a random thought and it took off. 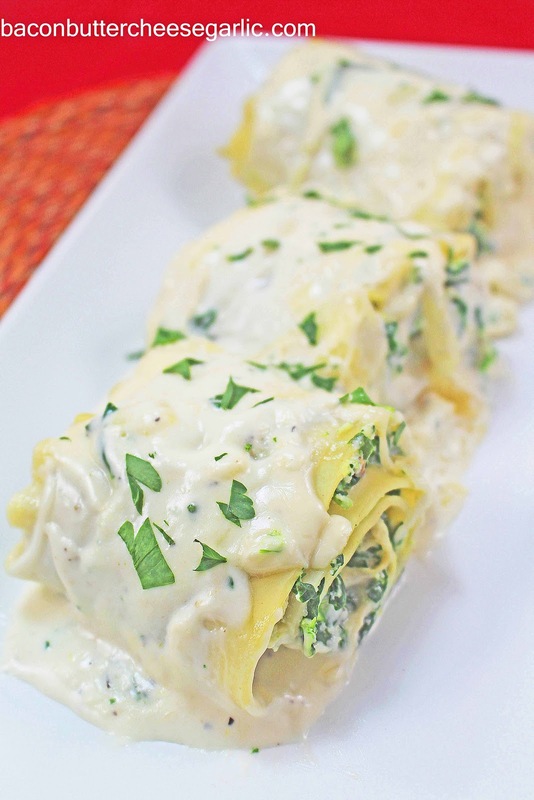 This recipe is for Chicken & Spinach Lasagna Rolls with Alfredo Sauce. It's really pretty easy to put together, and it tastes amazing! I hope you enjoy it! NOTES: I boiled the whole package of lasagna, but I only got 14 rolls and there were about 5 or six noodles leftover. It will just depend on how thick you spread the filling. Also, you absolutely have to turn the heat off on the sauce and whisk in the Parmesan cheese in small amounts. If you don't, the cheese will seize up and the sauce will be grainy. Preheat the oven to 350 degrees. Cook the lasagna noodles according to the package directions. Meanwhile, thaw the spinach in the microwave. Put the spinach in a towel and squeeze out as much water as you can. 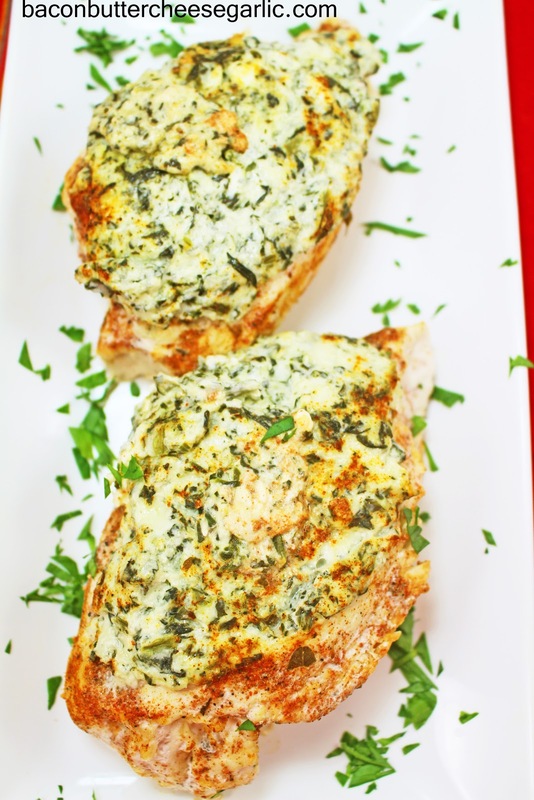 Put the drained spinach in a bowl and mix in the chicken, ricotta, egg, Parmesan, 1/2 C Mozzarella, garlic, and salt & pepper to taste. Set aside until ready to use. For the sauce, melt the butter in a pot. Add in the cream and bring to a boil. Add in the garlic and turn off the heat. Whisk in the Parmesan cheese in small amounts until the sauce is smooth and all the cheese is incorporated. Season with salt and pepper. Lay the lasagna noodles out. Spread about 3 T to 1/4 C of the chicken filling down the length of each noodle. 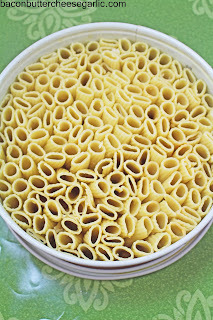 Roll the noodles up and place them in a greased casserole pan. When all the rolls are in the pan, pour the Alfredo sauce over the rolls and top the rolls with the remaining 1/2 C Mozzarella cheese. Cover the pan and bake it for 20 minutes. Remove the foil and continue cooking a few minutes to lightly brown the cheese. Garnish with fresh chopped Italian parsley, if desired. This is my favorite time of year! I don't have to take anyone anywhere. Just me in my car going to work. I don't have to rush to leave work to pick anyone up. I can mess around a little too long in the grocery store browsing. I can SLEEP LATER! It's awesome! And...I can assign MORE CHORES! Woo-hoo! I'm actually getting ready to type out a chores list for both of my kids and hang it prominently on the dry erase board. I can't wait to get home and see their half attempts at getting the chores done. Ha ha. But they really do all right. In celebration of the three whole months of my carpool freedom, we had Chinese food night last night. It's a huge favorite around here. It's also a huge production. But, thankfully, my wonderful husband always pitches in to help. We can't do just a simple main dish and a side dish. Oh, no. We have to have eggrolls and crab rangoon and fried rice and sweet and sour chicken and homemade sweet and sour sauce. I told you it's a production. 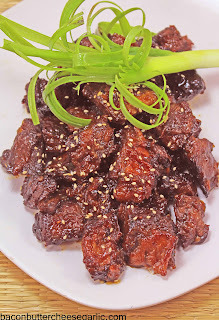 But the star of the night was Crispy Orange Beef. That was actually the easiest recipe of the night. You take a cheap, tough cut of meat, skirt steak, boil the heck out of it, and then "fry" it in its own fat in the oven. The outside bits are crispy and the inside is tender. It's darn tasty! It makes a heck of a mess in the pot, but a good soak lifts all the mess up. Enjoy! NOTES: Asian chili paste is also called sambal oelek. I can find it at Walmart or big grocery stores. Japanese 7 spice may be hard to find, but you can substitute Chinese 5 spice. White miso paste may be hard to find. I found it at a higher end grocery store in the refrigerated part of the produce section. It's not necessary, so you can leave it out. Cut the steak into bite-sized pieces. Peel the oranges and separate the sections. Don't discard the peel. If there are seeds in the oranges, remove them. Put all of the ingredients including the orange sections and orange peel (not the sesame seeds) into a large pot or dutch oven with a lid. Bring the pot to a boil. Continue boiling the pot uncovered until there's only about 1 inch of liquid left, which could take 30-45 minutes. Remove the orange peel from the pot. Meanwhile, preheat the oven to 450 degrees. Cover the pot and put it in the oven. Cook the beef for about 20 minutes to "fry" it in its own fat and crisp up the outside. Garnish the beef with the sesame seeds, if desired. Visit Bacon Butter Cheese Garlic's profile on Pinterest. Whenever I need cooked, shredded chicken for a recipe, I throw two or three chicken breasts into a pot of water. I add in seasonings that complement the dish I'm planning on making and cook about 20 minutes or until done. Then I cool it in the fridge until I'm ready to shred it. Quick and easy! There are an average of 8 peas in pea pods.